I have always thought highly of Richard Corrigan. I’ve been to his now closed Lindsay House and Bentley’s Oyster Bar and Grill and enjoyed them both. His style is big and bold, with lots of flavour, and it usually scores high on the comfort factor scale. So when I went to Corrigan’s Mayfair, I went with great expectations. This was the ‘replacement’ restaurant for Lindsay House which use to hold one Michelin star. In fact, when this place opened about a year and a half ago, there was much fanfare and great critical acclaim. Well I’m not sure what happened between then and now, but my meal was riddled with disappointments. 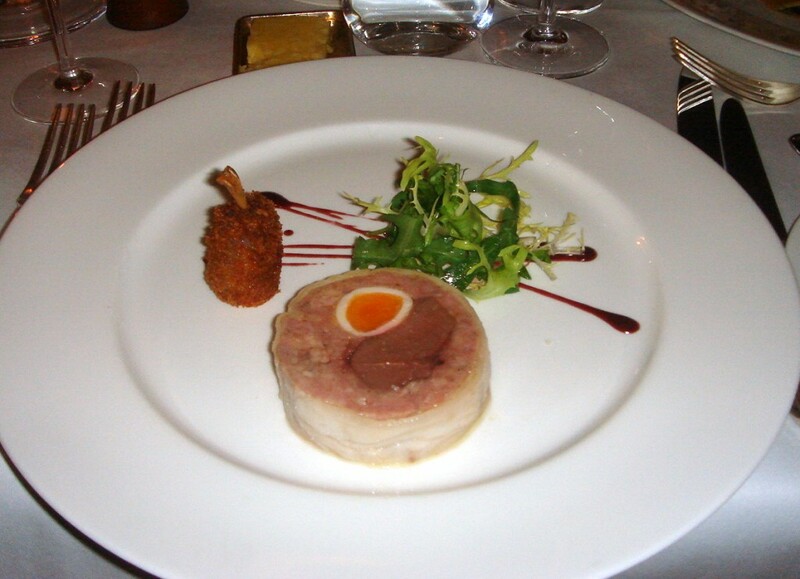 A starter of wood pigeon, soft boiled quail’s egg with sweet and sour onion (£15.50) turned out to be a terrine. Surely this should have been clearly stated on the menu? So while I was expecting a hot dish, I received a cold one instead. The terrine was only memorable for the fact that it was so heavily seasoned that the salt killed off any flavour. 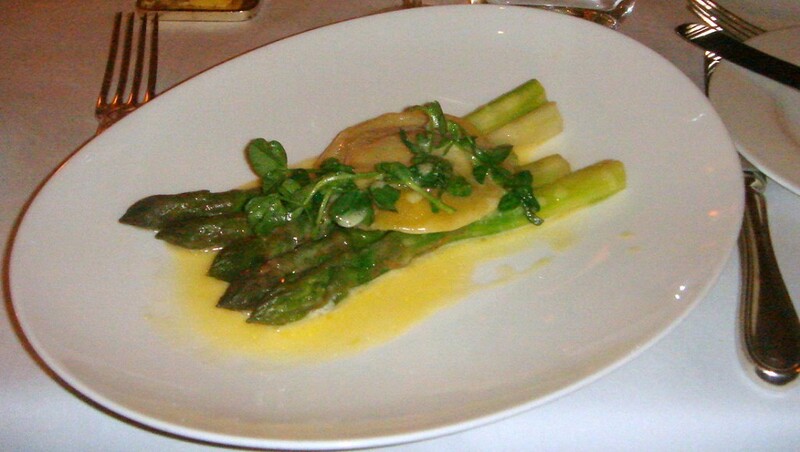 English asparagus with organic egg yolk (£12) was pleasant but unremarkable. 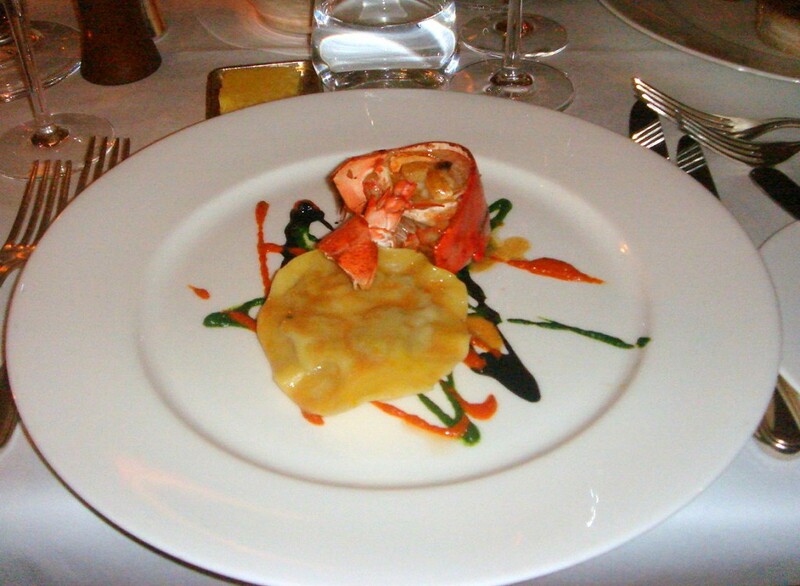 A third starter of ravioli of suckling pig (£16) came with a beautiful piece of succulent lobster in the shell which had been cleverly matched with a light, squid ink sauce. However, the ravioli was hugely disappointing as the suckling pig filling was bland and flavourless. The sensation of eating it was similar to chewing cardboard. 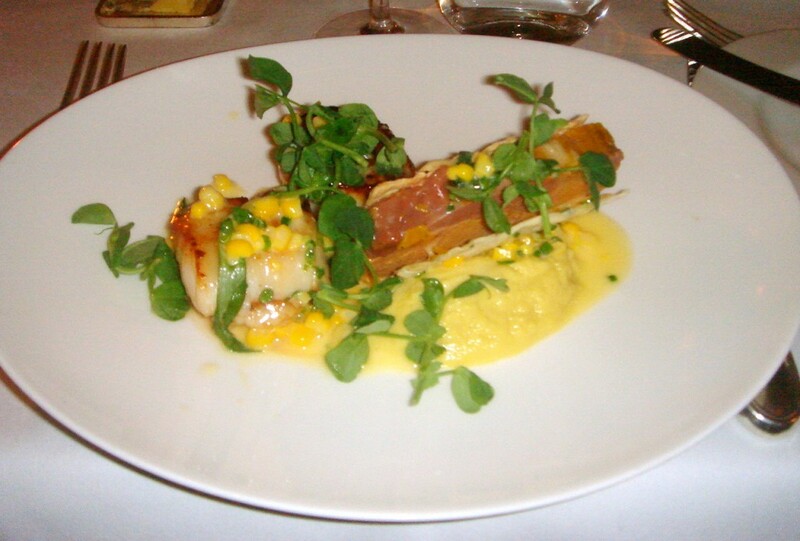 Another faux pas emerged in a main of pan roasted Cornish scallops, sweet corn and foie gras (£27.50). The sweet corn puree was icy cold, as if it had come straight from the fridge. This dish went back to the kitchen to get re-plated where the puree was brought to a respectable temperature, but this kind of ‘school boy’ error for a £27 dish is unacceptable. When warm, the three elements of the dish worked well together. The scallops were nicely cooked, and the foie gras, served as a parfait, was creamy and luxurious. But what I found difficult to swallow was the £27.50 price tag. The portion size was tiny, with only two pieces of scallop and a smidgen of foie gras parfait, which in itself is less costly than a piece of foie gras. This dish smacked of being a rip off and the presentation was messy. A rhubarb soufflé (£7.50) was lovely and light, with the bite-sized pieces of rhubarb being soft and not too tart. 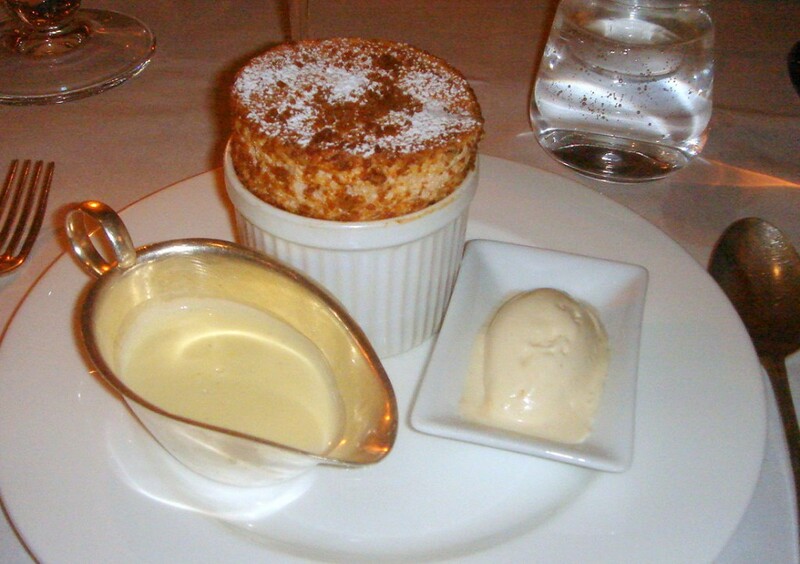 The soufflé worked well with the accompanying ginger ice-cream. This was perhaps the most enjoyable dish of the evening. The décor resonates with the feeling of a glamorous members’ club from yesteryear. The overhead lights emit soft hues over each of the tables, and the arty works placed strategically around the dining room add further elegance to the interior. There is no doubt that the interior is beautiful, but it was rather quiet on the night of our visit so it also felt stuffy. The service was fine, although my waiter tried to tell me that my corn puree was meant to be cold. This meal probably rates as my most disappointing of 2010 so far. No, it wasn’t all bad. I enjoyed the dessert, and when I overlook the cold corn puree, the scallop dish, albeit small and very pricey, was rather nice. But when you take into account how expensive the restaurant is (mains range £23 to £38), it’s hard to forgive some of the very elemental errors that we experienced. This is a Richard Corrigan restaurant, a chef who held a star at Lindsay House, and this meal was below par for a chef of his calibre. Standards seem to have dropped from the initial press plaudits which surrounded its opening. Price range: Three courses ranges from £39 to £64. Excludes drinks and service. I heard Richard Corrigan on the food program on Radio 4 this week saying that he considered blogs to be of equal importance to tradiotnal press restaurant reviews so let’s hope he sees your post! I hope that it isn’t a downward trend for them and just a blip. I agree with the pricing though, the asparagus and some of the other dishes seem very pricey. I know, everyone I’ve ever spoken to who has been to the restaurant has enjoyed it every time. I don’t understand the experience I had. Shame. Oh, no. What a shame. Corrigan’s Mayfair is one of my favourites when I’m in London, so I was sorry to hear you had a bad time there. I can still recall the crubeen salad and the ox cheek ravioli which were both sensational when I was last there a few months ago. As Sam says, I hope it was just a blip.